Whoa…I am really behind on posting updates! I was actually alive and well in 2016, but didn’t post a single thing about my “goings on.” I didn’t even get a blog entry posted in 2016. I guess I was too riveted on the unfolding presidential election year drama here in the USA. What a year 2016 was, eh? Against the odds, Donald J. Trump rose above the political fray to become our nation’s forty-fifth president. A lot of folks are happy about that, and perhaps just as many are dismayed, but our mandate as Christians remains the same. We are to pray for those in governmental authority. As for me, I am feeling a profound need for a re-tooling for the days ahead. Even the soft case for my guitar is wearing out and literally losing its “zip.” So one new development for 2017 will be a redesigned website and some fresh content. Check my site for the new look in the weeks ahead. Shana Tovah, everyone! That’s “happy new year,” Hebrew-style. Since I didn’t write this update in time for New Year’s 2014, I decided to take the opportunity provided by this fall season of the Lord’s appointed times. Rosh HaShanah was September 25, 2014. I continue to the lead the early worship service for Liberty Church (Birmingham area) most Sunday mornings. Until I get a new assignment from the Lord, I’ll continue to serve my local church family in this capacity. I am grateful for the help and support of our worship team and particularly of Liberty’s worship director, Jonathan Newman. I don’t know if I make his job any easier, but he sure helps me out a whole lot! We’re even beginning to try and write some worship songs together, and I am enjoying our first efforts. Teaching has more of my energy and passion these days. Last winter I taught from an excellent dvd series produced by the late Dwight Pryor (Center for Judaic Christian Studies). The title is “Behold the Man: Discovering Our Hebrew Lord, the Historical Jesus of Nazareth.” If you’re interested, you can find the material here. This fall my topic is “The Feasts of the Lord – God’s Prophetic Plan of Redemption.” I am so grateful for the rapt attention of the people who sit and listen to me every Wednesday night! They love the Lord and they love the Scriptures, and I just try to stay at least half a step ahead of everyone as we go through this study together. The fact that we are studying the feasts as they are occurring on the fall calendar make this class especially meaningful. It is easy to see from the Scriptures how Jesus fulfilled the prophetic dimensions of the spring feasts of Passover and First Fruits. Then ten days before Pentecost (Shavuot) He ascended to heaven in the sight of the early Apostles, and will return in the same way He was taken up (see Acts 1-2). One of the reasons for studying the fall feasts is to consider how the Messiah will return at the end of the age and the impact of His appearing on this world. So just where are we on God’s prophetic timeline? Personally, I believe we are on the verge of the awakening blast of Yom Teruah. I heard R.T. Kendall comment recently that he believes the next move of God will be the awakening shout that Jesus spoke of in His parable of the ten virgins (see Matt. 25:1-30). As Dr. Kendall put it, “There are things you will do in your sleep that you wouldn’t do if you were awake.” He believes the time will come when people will really begin to believe that the Lord is coming and will wake up and act accordingly. Amen to that! But the implication of the parable is that when the shout comes, you will face the Lord in whatever condition you are in. There will be no time left to change your ways. Now let me add a personal experience related to Dr. Kendall’s message. This past July, Dr. Kendall was the keynote speaker for the Liberty Fellowship summer conference in Pensacola, Florida. On the first evening he addressed us on what is basically the message of the last chapter of his excellent book on the Holy Spirit, titled Holy Fire (see Chapter 13 “Isaac”). At the end of his message, he stopped rather abruptly and sat down, having realized that he was at the end of his allotted time. Normally, we would have applauded and adjourned to another room for ice cream and fellowship. Our conference emcee tried to help us make the transition, but no one wanted to move. There was such a weight of the Lord’s presence among us, that we needed space just to sit there before Him in sober reflection. Dr. Kendall remarked later that he has never seen a group respond that way before to that particular message, and he has preached it in several places. I hope I never forget that night. A lot of believers today are asleep, spiritually speaking. Maybe you and I are, too. I mean, how do you really know you’ve been sleeping until something startles you awake? It’s only upon awakening that you realize, “Wow, I must have dosed off.” It’s far too easy for Christians to fall into a numbing slumber these days, even in the wake of the many crises happening around the world. You don’t have to look very hard to see the trouble. Islam is rising as a global power for the first time since the fall of the Ottoman Empire at the end of WWI. It appears to me that the seventh head of the beast which suffered the fatal wound by the sword is being resurrected (see Revelation 13). The radical group ISIS (or ISIL), aka the Islamic State, has declared a caliphate. In case you don’t understand the significance, please understand that in Islam, a caliphate legitimizes jihad. There hasn’t been an Islamic caliphate of any size since 1924, when the last caliphe of the collapsed Ottoman Empire was exiled to Paris. Remind yourself of the ongoing atrocities being committed against non-Muslims by ISIS. Realize that it is now open season on Jews and Christians in the eyes of any radicalized Muslim who recognizes ISIS, or any group like it (e.g. Hamas, Hezbollah, al-Qaeda, the PLO, Fatah, etc. ), as a legitimate government. If that doesn’t concern you as a believer and motivate you to pray, then you are definitely asleep! The recent West African outbreak of the ebola virus is another major world concern, and it’s already hit the U.S.. The first travel-related case was confirmed by the CDC on September 30, 2014. Then there’s the many personal concerns we all have. We need to be more diligent about our relationship with Christ than ever before; the only certain refuge we have in this world is the secret place of the Most High. Simply put, this is no time for Christians to be asleep! May you and I resolve to be spiritually awake and about our Father’s business, now and at the coming of the Lord. P.S. I highly recommend Dr. R. T. Kendall’s excellent book on the Holy Spirit, Holy Fire. I am also reading Jonathan Cahn’s The Mystery of the Shemitah. If you are familiar with his previous book, The Harbinger, this book is a further study into the harbinger of the shemitah, or sabbatical year. It is truly a jaw-dropping read. This is the space usually devoted to updating you on my recent goings on and whereabouts. If I had lots of ministry travel to tell you about, it would perhaps make for more exciting reading. I do not. Oh, I’ve been plenty active; it’s just that most of my ministry involvement for the year thus far has been local to the Birmingham area. As you may or may not know, my long-time music publisher, Integrity Music, sold to the David C. Cook Company in early June of 2011. As it happened, my exclusive songwriter’s contract with the company expired about the same time. Thus, a twenty-two year contract period came to an official end. The emergence of the Hosanna! Music recordings by Integrity was a unique era within the global worship renewal. I am enormously grateful for the opportunities given me as a writer over that period. I am grateful, too, that Integrity Music continues to administer my published catalog of songs with the same care and professionalism they have always exercised. Truth be told, publishing opportunities for writers such as myself are not what they used to be. I still write, but now I look closer to home for motivation. “So just what have you been doing this year, Lynn?” you might ask. “Same as always,” I could answer. Thirty-three years after writing “More Precious Than Silver,” in the context of local church life, I still lead worship frequently for my local church, and for a handful of ongoing conferences or gatherings that I return to regularly. At the same time, I often wonder and have even asked the Lord if the worship leading “exit ramp” might be just up ahead for me. The Lord only said, “I need you to do this for a little while longer.” So I shall. Seasons of ministry change, or even come to a close – but a seasoned minister will always have a place in whatever God is doing, as long as he or she remains faithful and spiritually awake, hand to the plow. God willing, that shall be me! I am grateful to know pastors and leaders who encourage me to stay the course. I did manage to give a concert of worship at Liberty Church, my home church, on January 20th. My pastor urged me to do so, against my natural inclination at the time. Though I did not feel like I was in the best physical condition to pull it off, I acquiesced and enlisted the help of musician friends Daniel Cason and Chris Griffin. Even with the short notice, many friends came to join us for a night of worship and ministry. I introduced new songs, and sang some old favorites. I have to say, it is always thrilling for me to hear every person in the house worshipping God with one of my songs, like “Ancient Words” or “Be Magnified,” with all their hearts. It does not get better than that for this songwriter! I have posted some new, unrecorded songs, along with chord charts, on my Music page. Look for them in the “demo” music player; scroll down to the 2nd one appearing on that page. Future songs will continue to appear there from time to time. This month look for “All Fall Down Worthy Are You),” and “Amen,” both inspired from the Book of Revelation. David Baroni sings on the demos he created for me. Also, you’ll find “King of All the Earth,” a co-write with Gary Sadler from just a few years back. I have pitched all these songs for Messianic worship projects, hence the Hebraic references to Yeshua. I’ve also posted “Praise Our God,” co-written with Steve and Vikki Cook. Vikki sings on the demo that Steve created. I made a hearty recommendation in my previous update for a book by Rabbi Jonathan Cahn, The Harbinger (Frontline). My recommendation still stands. If you haven’t yet read it, I urge you to do so as soon as possible. The message of The Harbinger is vital and urgent. Hello friends, and a belated Happy New Year! The holiday months have been somewhat quiet for me on the travel front, but I’m not complaining. I’ve had plenty of places to minister. Several new teaching opportunities came to me as a result of a presentation I put together for my home church on the prophetic history of the modern state of Israel. Many of us don’t know our own country’s history very well, much less the story of modern Israel. So it’s really exciting to point out the hand of God in history to fulfill the prophecies of the Bible concerning this ancient land. I was invited to share this presentation in October with Charity Chapel in Pensacola, Florida, and a local home bible study in November. I hope to do a few more of them in the coming months, and will continue to refine it. Most Sundays, of course, you’ll find me leading worship for Liberty Church’s early service, or teaching a class here and there. Speaking of things prophetic, I’d like to recommend a brand new book by Jonathan Cahn called The Harbinger (Frontline Publishing). It is based on a series of messages he preached to his Messianic congregation in New Jersey, not very far from Ground Zero of the 9/11 attack on our nation. I haven’t actually read this book yet (soon, I promise!) but I’ve heard all of the audio messages that the book is based on. The parallels that Rabbi Cahn points out between what happened to ancient Israel prior to the Babylonian invasion and what has happened in the U.S. since 9/11 is just astounding to me. God seems to have given him a voice to the nation at this time, and I really think it worth your time and money to consider what he has to say. If 9/11 was a wake-up call to our nation, it appears we collectively hit the snooze button. Yes, there was a sudden interest in “going back to church” for many Americans in the immediate days following the terrorist attacks, but that trend waned pretty quickly. No spiritual leader that I respect thinks we’re in a better place spiritually and morally as a nation since that fateful day in 2001. Indeed, the prevailing theme I hear from the voices I trust is that of strong warning – the warning of impending judgment. And by “judgement” I don’t mean the wrath of God. I mean God merely allowing us to reap the consequences of our own foolishness. Do you realize, for example, that we would have no problem at all funding Social Security today (despite it’s poorly conceived design) if we had not aborted over 50 million infants since 1973? There would also be plenty of buyers for the swollen inventory of houses currently on the market, foreclosed or otherwise. Much of the economic malaise we are suffering in the U.S. could have been avoided by simply honoring the sanctity of life for the last forty years. I could go on about our need to repent for “uninviting” the Almighty from our national life and such, but I won’t. I’m sure you know better preachers. Instead, I’ll just tell you that I’m posting a new song to my music page called “The Ancient Paths.” It is based on the text of Jeremiah 6:16. I hope it will inspire you to pray earnestly for America, or perhaps your own native country. David Baroni is the co-writer on this song, and he graciously produced and sang the demo for us. The recording is not “master quality,” and it can’t even be purchased anywhere. But I sense I just need to put it out there as it is. Find the 2nd music player on the Music page, and then click on this song title in the list. You’ll also find a chord chart with the lyrics. Whatever 2012 brings you, rest in the truth that God knows those who are His, and He will abundantly take care of His own! See to it that you do not refuse him who speaks. If they did not escape when they refused him who warned them on earth, how much less will we, if we turn away from him who warns us from heaven? At that time his voice shook the earth, but now he has promised, “Once more I will shake not only the earth but also the heavens.” The words “once more” indicate the removing of what can be shaken – that is, created things – so that what cannot be shaken may remain. I hope this update finds you well, with your eyes firmly fixed on the Lord Jesus and your faith unshaken, no matter what else may be shaking around you. My year began serenely enough. I was privileged to lead worship for Briarwood Presbyterian Church, Women’s winter retreat. The theme was “Choosing Rest,” based on keynoter Sally Breedlove’s book by the same title (Navpress). Little did I know, at the tail end of January, how much I would need that encouragement as the month of April drew to a close. February brought ministry opportunities for me among Baptist churches in Dora and Sylacauga, Alabama and also in Berea and Richmond, Kentucky during the first weekend of April. My thanks to the Tates Creek Baptist Association (KY) for the invitation. Two weeks later I was in Clearwater, Florida taping an interview featuring my book for a CTN program called “It’s Time for Herman and Sharron.” I am grateful to the Bailey’s for the opportunity to reach a national audience via their television ministry. About once a year I Iead worship for a Community Bible Study program in Homewood, Alabama. This year my invitation came on the Thursday before Easter. I then enjoyed a Black Friday worship service and supper with a small group from my home church. These two events really helped me prepare for celebrating the redeeming work of my Savior on Resurrection Sunday. Then came Whirlwind Wednesday! Here in Alabama, we are digging out from one of the worst tornado disasters on record. In the early morning hours of April 27th, a major storm cell moved through my own neighborhood, snapping off large trees like toothpicks, toppling others at the roots, and taking power lines down with them as they fell. The property damage is widespread in the wake of the EF-1 rated tornado that ripped through here. A second, much more devastating storm system moved through later that afternoon at wind speeds rated EF-4 and EF-5, with gusts in excess of 200 mph. Tuscaloosa, Concord, Pleasant Grove, Hueytown, McDonald’s Chapel, Pratt City, Cullman, and Huntsville are among the hardest hit areas. The smaller communities have been described by observers as “completely leveled,” and “wiped off the map.” Residents are stunned at the level of destruction in our state, and the desperate search for missing loved ones continues. As of May 1st, the death toll in Alabama is thought to be over 250 people. Every one of my neighbors sustained some kind of damage and there are many with monstrous piles of debris on their curbsides and blue tarps over their roofs, awaiting repair. I sustained some property damage myself, but it was minimal when compared to so many others. I am extremely grateful to have been spared worse and I bless the Lord for His protection and mercy! The preliminary reports on this deadly outbreak of tornadoes is that the continuous path of destruction that moved from Tuscaloosa to Birmingham was the result of a single tornado that stayed on the ground for nearly 80 miles. This storm was truly one for the history books! Alabama is not the only state in our country, nor place in the world, to see such intensity in recent weather-related destruction. The nations of the Pacific rim have been rocked by strong earthquakes. Remember the ones that hit Chile in 2010 and New Zealand just this past February? And who will ever forget the horrific images broadcast to the world of the tsunami that struck Japan on March 11th? The 9.0 earthquake that set it off moved that island nation thirteen feet closer to the United States. Incredible! Even governments are being shaken out of place. The political landscape of the Middle East looks very different today than it did just a few months ago, as long-held dictatorial regimes are falling in the face of popular uprisings. Will anything remain the same? In all of the tumult of these days, I am comforted by the fact that God never changes, that His mercies are new every morning, and the kingdom He has given us can never be shaken. For the present, I will be taking care of the storm damage to my house and property. I’ll be praying for the families of my state who have suffered terrible losses, and I’ll be looking for ways to reach out personally to affected friends and neighbors. If you want to help the tornado survivors of Alabama, I’d like to suggest that you make a donation to CBN’s Operation Blessing, the Salvation Army, or the Red Cross. Designate your gifts for "Alabama tornado relief." I hope you’ve been able to find a cool spot or two in your life this summer – it’s been a hot one here in Alabama! 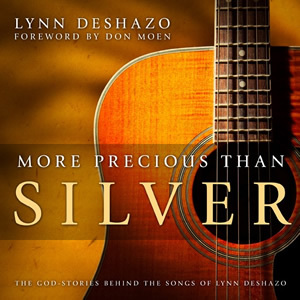 If you’ve already purchased a copy of my new book, More Precious Than Silver: The God Stories Behind the Songs of Lynn DeShazo, I want to thank you. I am also grateful for the thoughtfully worded comments I’ve received from some of you about the book. A kind word is always appreciated! It’s also available now as an E-book. You can buy it wherever E-books are sold, if that interests you. The older I get, the more the Lord seems to want to press me into service. So much for any thoughts I had of quietly cutting back! In April I started leading worship every Sunday (early service) for my home church in Birmingham, Liberty Church. Though I’ve been on worship teams since my college years, I haven’t had a weekly leadership responsibility since the 1980’s. It’s been wonderful for me – now that I know what I’m doing! – and I know the “1st service” folks appreciate my being there. In July, I helped lead worship for the Liberty Fellowship of Churches and Ministers. We hold our annual family conference in Lake Junaluska, North Caroline. In August, I ministered for the home crowd at Liberty (both services) in my first official “Songs and Stories” concert, based on songs written about in my book. What an epiphany for me! This is exactly the format I need to minister out of in this season of my life. Please get in touch with me if you would like me to conduct one in your area. I returned to western NC in August to help lead worship for the McLean Ministries “His Healing Presence” conference. This is always a very powerful time of healing for those present, and I am grateful to be a part of it each summer. I finished up my August travels in Valle Crucis, NC, where I enjoyed a few hours kayaking the New River with friends, and was the guest worship leader for Christ the King Anglican Fellowship in Boone, NC. They were also enthusiastic book and cd buyers, which is a true blessing to me! The weekend of September 24th, I’ll be in Pensacola, Florida, signing my books at the Barnes and Noble bookstore that Saturday from 4-6 pm, and ministering Sunday morning at Charity Chapel. See the web site for contact information. Late October to early November takes me back to North Carolina – I’m working on dates now for Burnsville and Hickory. In January 2011, I’ll be leading worship for Briarwood Christian Church’s women’s retreat. Briarwood is a large PCA church in my area, and they seem to like my songs a lot. If you’re on Facebook, send me friend request, as I post things there on a regular basis, such as media interview information and links to book reviews. Thank you for your continued interest, encouragement, and prayer support.